I’m doing the flowers for Kate’s wedding at the end of this month, and will create the table arrangements, boutonnieres and flower girl’s crown and other pieces from what’s in my garden. Even the bouquets will use plants from my landscape along with other, “store bought” roses. I know from previous experiences that this requires a great deal of trust and letting go. 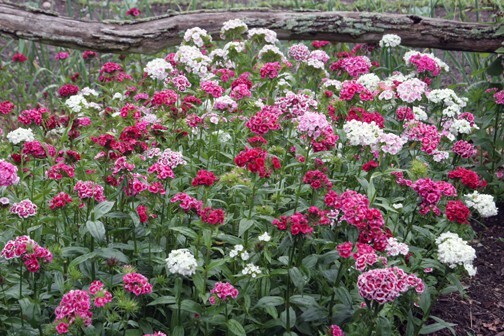 Looking back at garden photos for late-June in the past, I saw that sweet William, peonies and circle flower (Lysimachia punctata) should be in bloom. Maybe. Hopefully. Now that we’re getting closer to the date I find myself in the garden whispering to the peonies and sweet William that they just might want to slow it down, please. Knowing that they are likely not to hear my pleas, I have not choice but to look around for other flowers that will be in bloom at the right time. Yes, there are many. Thankfully. It’s just a matter of having faith and opening my eyes to other possibilities. I need to let go of my expectations and desires to have this particular flower, and allow that other blossoms will be equally as wonderful. This experience of committing to a project, expecting that it will go in a certain way, and being able to be flexible about things as they develop differently is a reproduction of our entire lives in microcosm, is it not? We need to be able to have a vision and work toward the completion of that dream while at the same time being able to change and adapt when circumstances dictate.